In an era of high-stakes accountability, school leaders often face contradictory pressures as they strive to improve student performance. 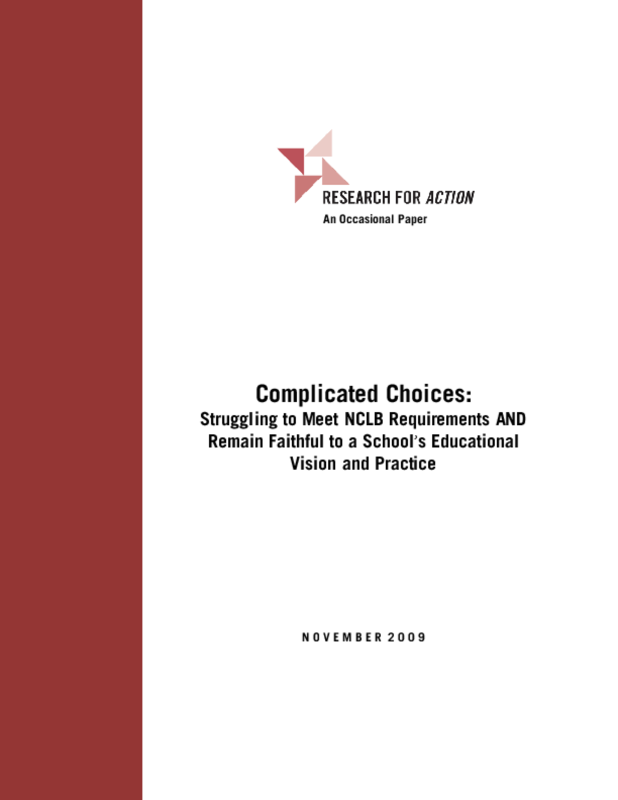 They must meet the federal mandate of NCLB for student achievement; at the same time, many believe that NCLB constrains their professional judgment about how to best teach and assess students in the context of their own schools. The case of Baker, a K-8 school in Philadelphia, is illustrative. The case study discusses the complicated choices school leaders made as they attempted to meet the needs of all students. As Baker implemented the school district's highly prescriptive approach to curriculum and instruction, using a Managed Instruction System, it struggled to maintain its progressive educational philosophy and 'best' practices. The school's pedagogical goals included: student-centered and project-based learning, teaching for life-long learning, performance-based assessments, and an emphasis on higher order thinking. Baker was a successful learning community for students and adults, whose significant accomplishments were obscured by the fact that it never had made AYP. If the U.S. Department of Education had permitted the state to use its valued-added growth model, the Pennsylvania Value-Added Assessment, as an alternative to the status achievement metric that focused on the percentage of proficient students, Baker would have made AYP in 2006-07, the last year of this research. Copyright 2009 Research for Action.